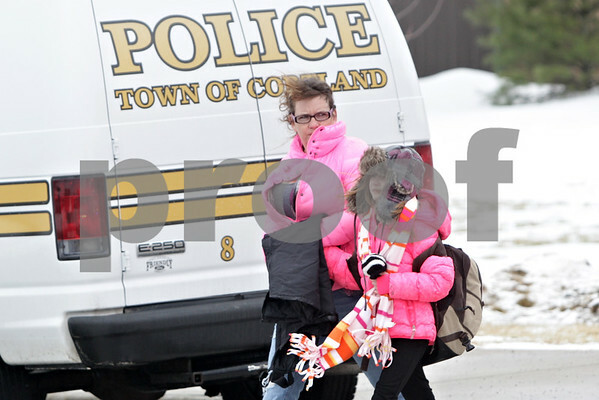 DaNee Walker leaves Cortland Elementary School in Cortland, Ill., with her daughter Paisley, 10, on Tuesday, Jan. 14, 2014. Gas released from the nearby landfill got caught in the school's ventilation system making staff and students nauseous. Emergency personnel from fire departments including Cortland, DeKalb, Sycamore, Maple Park-Countryside, Elburn, Burlington, Hinckley and Genoa-Kingston were seen at the school.